Ralph Wanger explains the principles of investing in small, rapidly growing companies whose stocks represent good value. Anyone who invested $10,000 in his Acorn Fund at its inception in 1970 would have $618,000 at the end of 1996. But whether you are investing in mutual funds or buying individual stocks on your own - or doing both - A Zebra in Lion Country offers an investment philosophy that will carry you through the rough spells and bring you greater wealth over the long term. Famed for his witty, insightful reports to shareholders, Wanger displays his irreverent savvy in this guide to locating small company "value" stocks that will yield well-above-average returns. As the title suggests, investors are like zebras in lion country: They must settle for half-eaten grass in the middle of the herd, or seek fresh grass at the outer edge, where hungry lions lurk. Wanger shows every investor how to achieve the right balance of safety and risk, and imagination and discipline, to survive and prosper in the investment jungle. 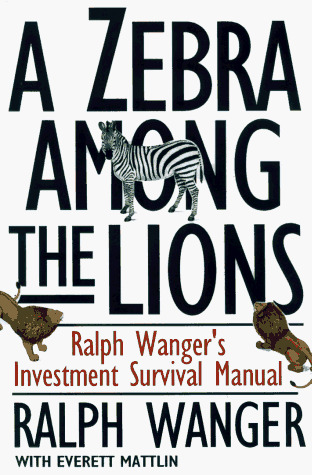 Destined to become a classic in the field of investing, A Zebra in Lion Country is as entertaining as it is instructive.